Grab four (or more) of your pals and make haste for some huge fun as you party-paddle this monster inflatable SUP! 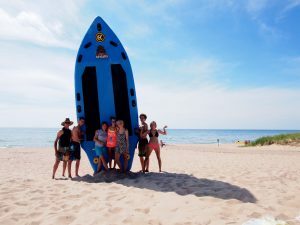 Put together a team of 5 or more and ride the surf or cruise our beautiful awe-inspiring shoreline. There is even room for a picnic on the water! Great for family gatherings, wedding parties or just plain, super memorable fun. 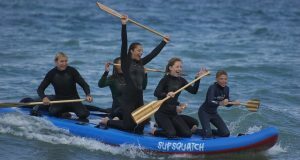 Come party-paddle with us!